Dance as though if no ones watching you, love as though if you have never been hurt before. 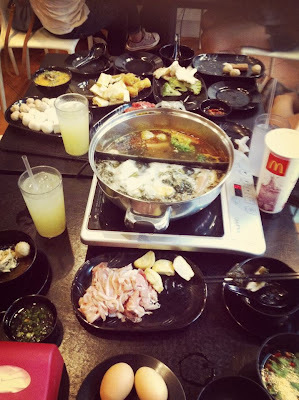 Steamboat with Teresa, ken and John for 2 hrs at one of the shop in Bugis. Sadly dint manage to take pictures with babe cause she's have sore eyes. Yep~ She eat with her shade on, how cute is that. Head off to Avalon with John during the night. It's sunday aka gay's night. Due to John is the photographer for avalon i manage to meet up with some of his friends which is yea gays and ladyboys. (John's not!) But they are real friendly and sweet. Sometime i think having ladyboy and gay friend are even better than some other jerks out there. There will be performers on every sunday by a group of hunks & ladyboys and it just kept my eyes glued on the dance floor. Those babes can dance and jump around with those super duper tall heels which is like i cant~~~ Really powerful. Next time runway can ask to learn from them HAHA! I will try to 'steal' some of the shoots on my next post so stay tune alright !